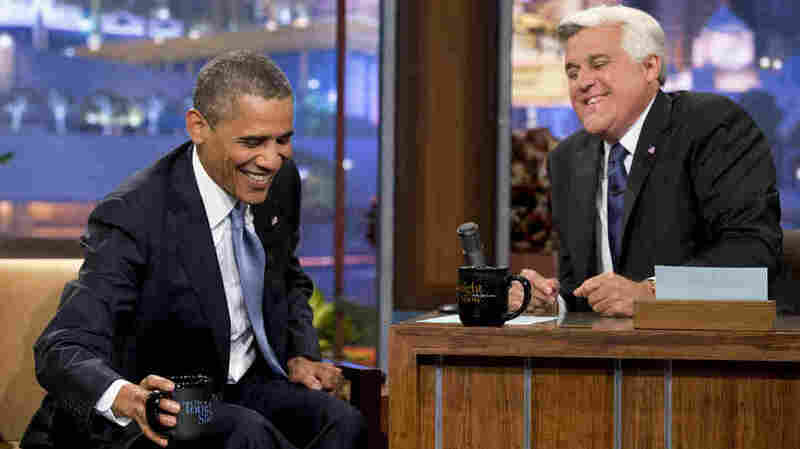 Obama To Leno: 'There Is No Spying On Americans' : The Two-Way President Obama on Tuesday defended the U.S. government's surveillance program, telling NBC's Jay Leno that any tracking of phone numbers or email domestically was "connected to a terrorist attack." President Obama jokes with Jay Leno during a commercial break at the taping of his appearance on The Tonight Show with Jay Leno on Tuesday in Los Angeles. President Obama defended the U.S. government's surveillance programs, telling NBC's Jay Leno on Tuesday that: "There is no spying on Americans." "We don't have a domestic spying program," Obama said on The Tonight Show with Jay Leno. "What we do have is some mechanisms that can track a phone number or an email address that is connected to a terrorist attack. ... That information is useful." Obama also called the National Security Agency's surveillance a "critical component to counterterrorism," and defended the shutdown of U.S. embassies and travel warnings this weekend, saying they followed information about a possible terrorist threat "significant enough that we're taking every precaution." But he added: "We're going to live our lives," and noted that for Americans, the odds off dying in a terrorist attack is lower than dying in a car accident. During a lengthy discussion with Leno, Obama said he was "disappointed" in Russia's decision to grant temporary asylum to Edward Snowden, the CIA contractor who leaked information about the secret U.S. electronic surveillance program. "There are times when they slip back into Cold War thinking and Cold War mentality," Obama said of Russia. "What I continually say to them and to President [Vladimir] Putin, 'That's the past. We've got to think about the future.' "
Obama added that the U.S. government has been trying to reduce reliance on contractors, and asked rhetorically: "When it comes to intelligence, should we in fact be farming this much stuff out?" Obama reiterated that he planned to attend the upcoming G-20 summit in St. Petersburg, Russia. "It's important to us," as the world's leading economy to attend, Obama said. And in response to a question about Russian policies toward gays, Obama said any nation that violates "universal rights ... race, religion, gender or sexual orientation, you are violating the basic morality" that should transcend every country. Obama said that when he spoke out about the acquittal of George Zimmerman in the killing of unarmed teenager Trayvon Martin, "What I wanted to try to explain was why this was a particularly sensitive topic for African-American families." Obama said he invited former Secretary of State Hillary Clinton, a potential 2016 presidential candidate, to a recent luncheon at the White House. "She had that post-administration glow," Obama said, and called her a "great secretary of state." Leno: "Did you notice her measuring the drapes?" Obama: "Keep in mind she's been there before. She doesn't have to measure them."